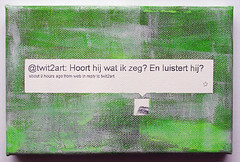 Image by Twit2art via FlickrCute experiment by Doug Henshen showing that a web2.0 guru (Dan Keldsen) promoting twitter (“I’d rather that you use Twitter“) in reality responds via e-mail. Is e-mail still not beaten ? My statement “I’d rather that you use twitter” was a dramatization (that presentation was a skit, and I was in character) we should all be using the appropriate tools for the job, especially given that Twitter is awfully unstable in recent weeks. I a sure that the test and findings of Doug ware also just a dramatization, just like my post, and in no way a judgment of web2.0 or twitter. Like you said, it shows that indeed there has to be a somehow aligned community to have the right communication effectivenes.